(Cincinnati, Ohio, Sept. 5, 2017) - A little more than two months ago, Quintin Berry was home in San Diego taking swings in the batting cage while wife Priscilla fed the pitching machine. On Tuesday, he joined a Major League pennant race. The Brewers purchased Berry's contract for the remainder of the regular season, adding a burst of speed to the bench. Berry, 32, is 27-for-28 on stolen-base attempts over parts of four big league seasons, on top of his 389 steals in the Minors. "I don't think it's any secret why Quintin is here. 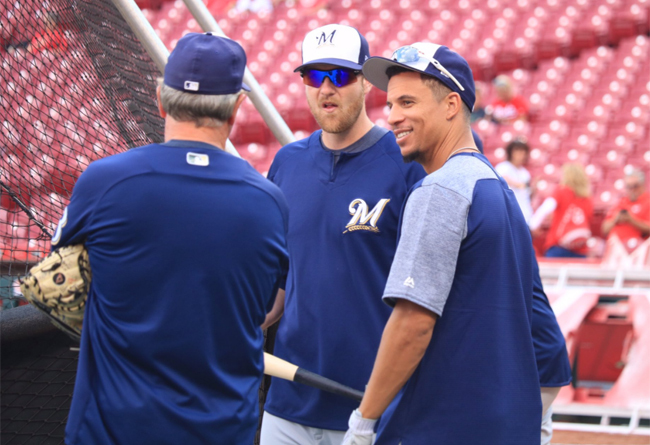 He is here to be a baserunner," Brewers manager Craig Counsell said. "It's a limited role. There could certainly be some defense in there, but he's here to be a baserunner. It's a small part, but you're hoping he impacts a couple of games." Aside from 2012 in Detroit, Berry has always been a speed specialist. It explains how he appeared in 31 games for the Red Sox, Orioles and Cubs from 2012-15 and took only 11 at-bats. "That's my role," Berry said. "I've never been up with a team that's out of it. The few games I've been up, it's been with a team in a pennant race." The Brewers are Berry's 12th organization. He began the year with the Twins but felt his release coming before the club made it official in early May, leaving him jobless. So he went home to San Diego and stayed in baseball shape before singing with the independent Long Island Ducks at the start of July. The Brewers inked him to a Minor League deal on Aug. 19. He went 12-for-42 with the SkySox, stole two bases without getting caught and hit his second home run in Monday's regular-season finale. "It has been an interesting year for me," Berry said.